Celann is a Breton warrior and vampire hunter who can be found at Fort Dawnguard. Like Dawnguard leader Isran, Celann is a former Vigilant of Stendarr, but they both left due to dissatisfaction with the organization. Later on, they parted ways, but naturally Celann was one of the first warriors to be offered a place in Isran's newly formed Dawnguard. Like many other members of the Dawnguard, Celann will be available as a follower upon completion of the quest Prophet. He is clad in a set of Dawnguard light equipment. This includes the gray cuirass as well as matching pairs of gauntlets and boots. He is equipped with a Dawnguard war axe and carries a torch. He knows the Restoration spell Sun Fire. 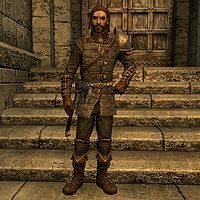 When you arrive at the gate of Fort Dawnguard for the first time, along with newcomer Agmaer, you will find Celann guarding the gate, saying: "New recruits? Hmm. ", "Here to join the Dawnguard? Good." and "Isran will decide if you've got what it takes. Go on, he's right inside." When you speak to him he will immediately share his concerns: "I'll tell you, the only thing more surprising than hearing from Isran after all these years was hearing that he wanted my help. I immediately realized things must be pretty bad. Looks like I was right." If you ask whether he's worked with Isran before, he will then tell you about his past with the Dawnguard leader: "I have. There was a time, years ago, when we were both members of the Vigilants, and both equally dissatisfied with them. Their hearts are in the right place, of course. But Isran and I were never comfortable. We left together, but that partnership didn't last very long. I didn't agree with some of his methods." He will finish the conversation with an encouragement: "Go on inside. Isran'll want to talk to you." and his standard farewell: "May you always prevail." When you return to him after Isran's given you the quest Awakening, he will joyfully remark: "Isran found something for you to do, eh? I thought he'd like you. Good luck!" When you leave Fort Dawnguard, Celann will start his regular routine. He owns one of the cots in the northern section on the ground floor and sleeps there between 8pm and 4am. After he wakes up he walks over to the western dining area where he hangs out all day long, eating, relaxing, or wandering around. However, during the quest A New Order, when you return to the fort after visiting Volkihar Keep with Serana, you will find Celann, Isran, and Durak fighting off an attack by vampires just outside the gate. After the battle, Celann will retake his position outside the gate, ready to protect the fort. He will stay put until you bring the reinforcements, Sorine Jurard and Gunmar. Once the quest Prophet has been completed, Celann will also be available as a follower but will keep up his daily routine. When it is time to confront Lord Harkon during the quest Kindred Judgement, Celann will listen to Isran's speech in the main hall along with the other Dawnguard members. When Isran gives the order, Celann travels halfway across Skyrim to Castle Volkihar and will participate in the joint effort to kill all residing vampires, while shouting: "Kill the abominations!" When all is said and done, he will sheathe his weapon and walk all the way back to Fort Dawnguard and live there indefinitely with the other members. Celann is one of few followers who have no maximum level. He will continue to level up with you. If you have installed the Hearthfire Add-on, Celann is a potential steward. He has the Custom Fit perk even though he is more proficient in Heavy Armor. This issue has been addressed by version 3.0.11 of the Unofficial Skyrim Legendary Edition Patch; he has been given the Well Fitted perk instead. He has the Champion's Stance perk even though he is more proficient in one-handed weapons (and has 3 perks for them).